As most of you know, I love knitting something challenging. That is why I am “into” knitting relief sculptures. To that end, I thought I might share my thought process in planning for this type of knitting. The above pillow design (Sparky) has become the number one attraction in my home. Everyone who comes has to pet the “dog.” I can see that I will be sending this one to the groomer quite often. 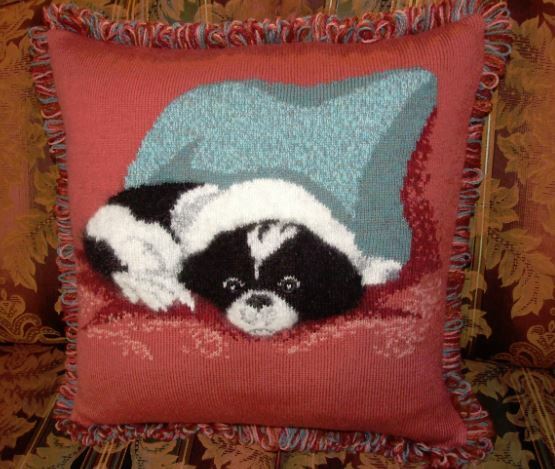 As a result of the reaction to the realism of this design, I took on the project of creating another”doggie” pillow for one of my singing companions. 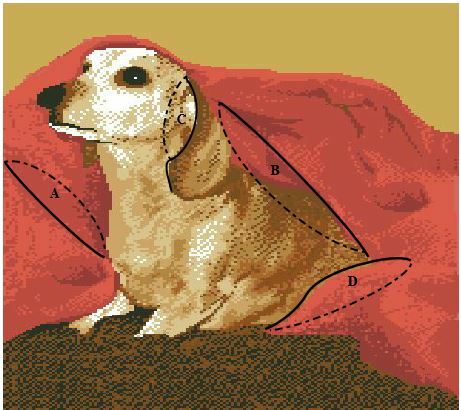 This time I will not only raise the dog, but I want realistic folds in his favorite blanket. So-besides adding an extra ply of yarn to the areas of the dog that I want to raise, I will create increases on one side of the ridges (solid black lines) which will allow me to create life like folds in the blanket surrounding the subject. Fans A,B, and C will be folded under, and the ridge will be on top. Fan “D” is just the opposite. The additional stitches forming the out side edge of the fan ( dotted line) will fold up to resemble the natural fold of the mounded fabric. The areas immediately adjacent to the fans will be filled to soften the incline to the folds. OK! Now how will I mark the chart? Humm???? I will designate the ridge stitches with a solid circle. I will place a marker on the each side of the ridge stitch. As I add stitches I will move the fan side marker. to indicate the added stitch. This way, I won’t have to mess with the chart, as these stitches will not be counted, I will simply knit the next stitch in the color indicated on the chart. All the additional stitches will be added in the color of the ridge stitches. I plan on keeping my fan width at no more than one inch, or 9 stitches at its widest part. I will post the results of my experiment when finished. Another possibility is to pick up stitch along the side of the head and knit the ear separately. Hummmmmm…??????? I have ordered a “fudge” colored kid mohair to be worked in with the varied colors on the dogs coat, and will use white mohair to add his graying hair on the face. This should be a fun project. I can’t wait to get started.